Provide your staff with a safe ATV environment via an Adventure 4WD course. We can make your launch a spectacular success! Government or Industry we can show you how to drive a 4WD safely. Looking for a great holiday location? Why buy it when you can hire it? 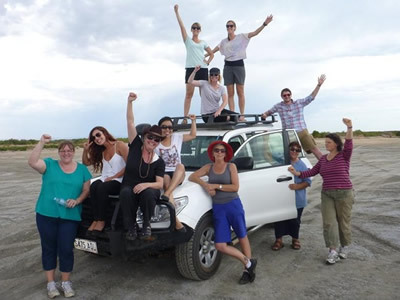 Exploration or production crew can benefit from Adventure 4WD's Mining Industry programs. Life-changing skills for a new lifestyle! Here's out latest video tests so you can find out what's good and what's not with the latest 4WD releases. First Time Out has been a favourite with clients for nearly twenty years, in two parts, a Wednesday theory evening followed by a Saturday practical. If you are employed by SA Government and use 4WDs or ATVs in your work you'll find the only contracted driver and rider training programs right here. Just enter your South Australian Government email address to access our South Australian Government user intranet site. Rent a Kimberley camper trailer and make that Outback camping holiday a comfy one! Grab a gift voucher to join us on one of our incredibly popular recreational courses? When it comes to reversing there’s the good, the bad and the ugly! Towing is one of those jobs that really bring out the worst in people’s skills. Some will look over their shoulder, others use their mirrors, whilst others will use a combination of the two. I tend to use mirrors as I believe it affords the best view and once you’ve got the knack of the distances seen in your mirror view and gotten your head around the initial turn in the opposite direction when reversing with a curve in the way, it’s a cinch. Looking over your shoulder can do a couple of things. One is that you can get messed up pretty quickly with your turns, flailing away at the steering wheel with too much input. Second is if the vehicle is chockers with gear you won’t see a thing out the back window. Something else that really helps with a dual-cab ute is a reversing camera. Any reversing or backing up to a tow hitch is dead easy with a camera focussed on the connection, when you don’t have the benefit of an assistant offering directions.